DEATH OF ONE OF THE INJURED MEN. FORMAL OPENING OF THE INQUIRY. Jr. W. E. H. Winston, deputy-coroner, formally opened an inquiry on Tuesday afternoon, in the Boardroom of the Ilkeston Hospital, concerning the death of Joseph Crossbey, one of the men who was injured in the explosion which occurred at Manners Colliery, Ilkeston, on Thursday afternoon of last week. Mr. G. Allsebrook, manager of Manners Colliery; and Mr. Jas. Haslam, secretary to the Derbyshire Miners' Union, who represented the widow. Before "swearing in " the jurymen, the Coroner said : —We are met this afternoon, to inquire into the cause of the death of Joseph Crossbey. This, gentlemen, I am sorry to say ,is the result of the accident which happened at the Manners Colliery last week, and with which no doubt you are all familiar. I was very much hoping there would not be any fatal result through that accident. Unfortunately, this poor young fellow has succumbed through circumstances arising out of that accident. It becomes our painful duty to inquire into the means by which he lost his life. It- will be impossible to go into the case at all to-day. I was obliged to open it today on account of many other engagements I have this week. There will have to be a good deal of inquiry, too. It is desirable there should be plenty of time to make these inquiries for you. I am sorry we shall have to adjourn for some considerable time. I am afraid none of the men in the hospital will be fit to attend to give evidence for at least a fortnight. That is only an opinion. It will be advisable. I don't want to bring you together oftener than necessary, it will depend upon how they go on and I therefore propose to take evidence of identification, today, and then, adjourn for some time. I should like also to say how very thoroughly I sympathise, and you sympathise, with the relatives of this man who has been called away; also with the relatives of the other men in this sad affair that has happened. I know we can congratulate ourselves in Derbyshire that we have considerable immunity from large accidents such as we often read about happening in other places. There are many falls of bind, and that sort of thing, but it is very seldom we are called upon to inquire into an explosion of this sort, in which so many man are injured. Our sympathy goes out to the men themselves and to their relative's, especially to the relatives of this poor man, who has met with his death as a result of this affair. The jury expressed, concurrence with the coroner's sympathetic allusions. Mrs. Emily Crossbey, 70, Mill street, Ilkeston, said the deceased was her husband, who was a miner, and worked at the Manners' Colliery, Ilkeston. He was 36 years of age. On the 21st inst. he went to work between 15 and 20 minutes past six o'clock in the morning. She saw him when he went to work He was in good health. Between 3 and 4 o'clock on Thursday afternoon she heard that there had been an accident at the Manners Colliery. A man in Critchley street told her that her husband had been hurt. She saw her husband the same day in the Hospital, about six o'clock. She had seen him frequently afterwards when she visited him. Miss M. B. Latham, matron at the Hospital, said deceased was admitted last Thursday afternoon, and was detained as an in-patient. Ha died about 20 minutes past five o'clock on Monday afternoon. She was present when he died. The Foreman of the Jury: Did death come as a surprise to you? The' Matron: "A little', perhaps. It came as a. surprise?—Yes. No expectation?—Yes; some. It was more sudden than we expected. Are we to understand that from your point of view, you considered that the inflammatory condition was sufficient to result in death? — Yes; I do think so. The Coroner said that, was as far as they could go that day. He was adjourning the inquiry for a fortnight; but it would all depend on the patients. Mr. Allsebrook: It will be wise to adjourn it long enough. The Coroner said he proposed to hold the adjourned inquiry in the Town Hall. The Hospital authorities had kindly placed the Boardroom at the disposal of the inquiry held in other cases. But in this case various official representatives, with other people, would be present— Mr. Stokes, the Government Inspector representatives of the Manners Colliery Company; Mr. Haslam, who was representing their widow; and others. If there were any plans to be introduced the Town Hall would be more convenient. The inquiry was then adjourned to Wednesday, October 11th, at two o'clock in the afternoon. The Coroner said it might be a long inquiry. Last Thursday Manners Colliery, Ilkeston, was visited by Mr. Stokes, his Majesty's Inspector of Mines for the district, in company with several of the officials, and a minute examination was made of the scene of the occurrence. No trace of gas could be found in any of the workings, and the investigation tended to confirm the surmise originally formed as to the cause of the explosion. Above the Piper seam, where the explosion took place, are located the main soft and the main hard seams, which were originally worked by a neighbouring colliery, but were abandoned some; years ago. The main hard seam was situated some 17 yards above the Piper and the soft seam about 16 yards above the hard. The result of the Examination and the information obtain and from men who were at work led to the opinion that a settlement of the strata immediately above the Piper seam had taken place, causing a fracture which allowed gas to escape, which had accumulated in the seam above. The gas was fired by a candle held in the hands of the men at work. The electric coal cutting machine had nothing to do with the occurrence, for the current had been switched off, and it was not working at the time of the explosion. 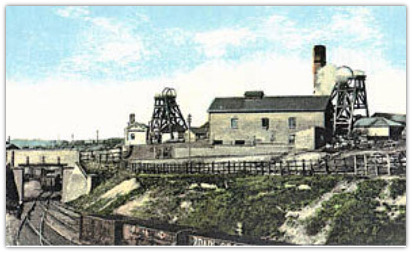 The fact that a, naked candle was used in the pit was not unusual, for gas was practically unknown hitherto, and the Manners Colliery, in common with many other pits in the district, was often worked with naked lights. The force of the explosion was not very great. The doors and ventilating arrangements, even in the immediate neighbourhood, were practically undisturbed, there were no flaws, or cracks in the roof, apart from the fracture; which admitted the gas, and none of the ponies or pony boys who were working in a pass-by, some 40 yards from the scene of the explosion, were injured. We regret to state; that a second death occurred in the Hospital late on Wednesday night, the victim being Joseph Jordan, of 27, Awsworth Road, Ilkeston, who had been in a dangerous state for some time. There are still eight others in Hospital, who were progressing as favourably as can be expected. To The Editor Of The "Pioneer"
E. MUIRHEAD EVANS, Vicar of Ilkeston.